This year´s TOTAL MUSIC MEETING will take place in the new auditorium at Berlinischen Galerie which will open its venues at Alte Jakobstr. 124 – 128, located in Berlin-Kreuzberg, on October 23. After more than seven years this exquisite and unique collection of fine art, photography and architecture will be accessible again for the public - on 4.600 qm exhibition spaces. 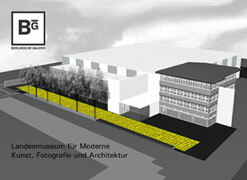 For further and more detailed information visit www.berlinischegalerie.de. For the duration of the TMM-Festival (Nov 4 – 6) you will have access to all exhibitions until midnight when showing your concert ticket or festival pass. TOTAL MUSIC MEETING is alive – despite all obstacles and budget problems we managed to maintain this International Artists Festival For Improvised Music – with the help and support of musicians, artists and (many) private and (a few) public donators who share our interest in Improvised Music being one of today´s major musical movements and influences.